I’ve had some requests lately to share casual work wear or outfits that would be appropriate for a classroom setting and while I haven’t set foot in a classroom setting in awhile, I would put money on the fact that teachers are all about the comfort aspect while still trying to look cute and professional. This is normally where I would give a speech on stretchy pants and dresses: two must haves for the comfy lover but I’ll refrain because I know you ladies know what I’m talking about. As soon as Walmart announced that Maurices was launching on walmart.com, I knew they would have some great casual pieces that would be perfect for the classroom or a casual office setting. I was pleasantly surprised by these button fly jeggings. They have the look of jeans, the stretch of jeggings and the quality of designer denim. I am wearing the same pair of denim in both the first and last outfits. The only difference is that I cuffed them in the last outfit making them look like an almost completely different jean! These jeans do run on the bigger side so I would suggest sizing down if in between sizes. I went with the XS short and would have done an XXS had they have had it. I picked up several other pieces from the Maurices line that are not only appropriate for the office or classroom, they are just great basics to add to your closet. I can promise you that this anorak jacket will go with just about anything and everything. I’m talking over basic tees, blouses, dresses and even jumpsuits. I’ve tested this theory and I promise it works and it looks just as cute as can be. The green color option is my personal favorite but it also comes in a pretty blush pink color that is perfect for Spring and has the prettiest eyelet detail. Next up, let’s talk shoes. Since heels can be a little too aggressive and usually not the most comfortable for someone on their feet all day, I found two pairs of wedges that are super cute, under $20 and the perfect height for the classroom. If wedges are still a little too much of a commitment for you, I found this pair of on trend white mules that I absolutely love. For sizing purposes, if you are in between sizes in any of the Time and Tru wedges, size down. I’m normally a 7.5 and went with the 7s. As for any of the Time and Tru sandals, I size up a half size! If you are in a work clothes rut and looking for a fun piece to add into your rotation, try a midi skirt! I personally love the idea of midi skirts in the office because they are an appropriate length while still being feminine and cute! It’s a stand out piece that everyone is sure to recognize which is one positive. The other is that it’s longer than a pencil skirt which means you don’t have to shave as high LOL. The less effort to get ready in the mornings, the better. You feel me? I rounded up several other midi skirts that are appropriate for the office and sure to be a staple in your closet. The great thing about all of these is that you could dress them down for the weekend as well. My favorite way to style a midi skirt lately is with a graphic tee and sneakers! It’s been a hot minute since I did a day to night work wear edition and they are always some of my favorites! While I am no longer in the corporate world, styling work wear is always my fav. I showed these pictures to Mama Adams last week and she goes “You need to stop wearing leggings and start wearing more work wear!”. While I can promise you the leggings are never going to stop, I do want to get better about showing you how to style one piece multiple ways more often because I like the challenge:) So if you have any items of clothing you want me to style multiple ways, let me know! Or if you just want to see more creative work wear options like this mesh sleeved top, let me know that too! This fun mesh top runs true to size and is a piece that can easily take you from day to night. If you don’t feel like the mesh sleeves are appropriate for your office environment, wear a blazer over it and then shed the blazer for happy hour! I am loving this pink one on major sale that would look cute paired with that top and a black pencil skirt. Now that the cooler weather is *hopefully* here to stay, I wanted to show you ladies how to style some Fall work wear! I’ve rounded up my essentials when it comes to your workwear wardrobe in the cooler months and I’m showing you multiple style options for each. It’s always important to me to buy pieces that are versatile enough for the office or weekend wear so in addition to sharing some of the hottest office trends this Fall, I’ve also made sure to include style tips on other ways to wear these pieces. When the temps start to drop so should the length of your pencil skirts. That being said, shorter pencil skirts can still work if you live somewhere where the weather doesn’t match the season but I suggest opting for something a little warmer such as wool, suede, tweed or sweater material. The longer length of these skirts also makes them great options for church as well. Velvet is one of my favorite fabrics come Fall and Winter so I love that retailers are making options for the office as well. Make a bold statement with a velvet blazer! The best part about blazers is that they don’t have to just be for the office. Pair it with a cotton tee, jeans and sneakers to dress it down. Or even with a lace cami, leather leggings and heels for date night! Leopard is hands down the hottest print of the season! Basically any option you choose for the office can easily be transitioned to casual wear as well because the trend is just so big this season. See below for more office appropriate, style options as well as more pictures at the bottom of the post! The trick to surviving your 9-5 in the colder weather is layers. If your place of work is anything like mine was, you’ve got to somehow dress for freezing temps outside and a sana inside. This is where having a few coat, sweater and cardigan options in your closet that will go with multiple outfits is great. This way you are warm enough for the walk from your car to the office and then once inside you can shed one layer and work comfortably. Might I add that as essential black legging and a pair of hose are also necessities for layering on bottom. The below outfit could also be worn with a pair of hose and booties or boots for a little more warmth. Turtlenecks are making a come back believe it or not and i think they make the perfect layering piece. If you live somewhere where it’s not quite “cold” yet, throw on a sleeveless turtleneck with slacks or a long sleeve turtleneck with a skirt. My favorite way to wear them right now is tucked in with a cute belt and scarf. Style tip: everyone loves an all black look right? It’s slimming and chic! Try it for the office: black turtleneck + black slacks but add a leopard belt or a plaid scarf! Have you ever wondered if you can wear a sweater dress to the office? The answer is heck yes. My only piece of advice is look for ones that aren’t too tight but also aren’t too oversized. If you already own a more oversized sweater dress, make it more work appropriate by adding a belt at the waist so it looks more tailored. Be careful if pairing a sweater dress with boots. I highly suggest making sure that your boots are below the knee unless you work in a very casual office setting. Tunics were my very best friend where I worked. I will say that they are probably more on the casual end of the business casual spectrum so make sure that this is acceptable for your office setting. If it is, you are looking at quite possibly the most comfortable cold weather look possible. My favorite way to style tunics is with the same essential leggings I mentioned before, a pair of boots, and a scarf (my go to is this $19 leopard one). Chances are you will be wearing a lot more pants now that the cooler weather is here so might as well make them super comfortable right!?! If your office allows corduroy or velvet jeans, I highly suggest getting these bad boys in every color. While they are technically a “jean” they look much nicer and are usually appropriate for most office settings. I personally own olive, black, blush, burgundy, and grey pairs aka one for each day of the week. See below for some more style options that offer maximum comfort. Finding the right work bag that will fit all of the things can be tough, plus chances are you are going to use it a lot so you want a quality bag. I got you girl! Here are several options that offer enough storage space for things such as laptops, lunch and like I said before, ALL OF THE THINGS. This is probably the number one requested thing from you ladies is “What shoes do I wear when it gets cold?”. “Can I wear booties to work?”. Unless you live somewhere where you are dealing with snow or ice on your way in to work, my answer is wear whatever you are most comfortable in. I personally wore these mules almost every single day when I was working in an office. You can 100% still wear your normal work pumps to the office. Also, boots and booties are appropriate as well, just make sure they are on the nicer side. It is my personal opinion but I would not suggest wearing over the knee boots to the office unless you work in a very casual work environment. Every time I ask you ladies what you want to see more of, the answer is always the same. The verdict is always one piece styled multiple ways because around here we are all about getting the most bang for our buck. Well let me introduce you to quite possibly the most genius idea to having more styling options without paying for multiple pieces: reversible clothing. White House Black Market has come out with a new Reversible Collection that is changing the game. The line includes reversible tops and dresses which is really amazing when you consider how many more outfits you can make when you get two for the price of one. I am styling one top, two ways for you ladies but I also want to note that their reversible dress collection is just as fabulous. From work to weekend, I’m amazed that this collection can do it all. If you are in need of a little black dress, this is my favorite one from the reversible collection. Such a great option for work, date night, church or weddings! If you are looking for business professional clothing, White House Black Market has you covered! You will find suits that have a little more character than say your run of the mill, no personality black suit. For instance, I love that this skirt has a flounce hem which is something I have never seen before and is so flattering. If you are confined to wearing a suit everyday, you might as well have some fun with your options! My blazer also has a slight peplum detail to it that makes it stand out and hug your girly figure a little better than most. I particularly love that it is a three quarter sleeve which makes wearing a blazer in this southern heat a little more bearable. 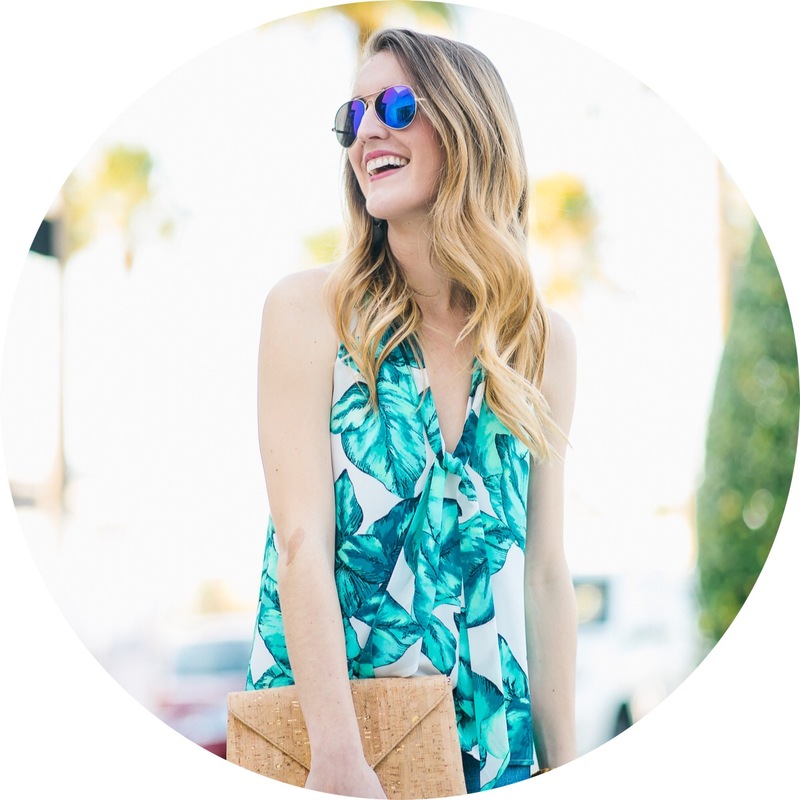 I almost couldn’t believe the transition from yellow to such a bold patterned top! My favorite part being that once turned to the patterned side, the yellow still shows on the bottom of the tank for a layered look. I styled this look for a casual Friday at the office but as soon as that blazer comes off, you are ready for after 5 cocktails! I’m already planning many nights out with this little tank. One of the reason’s I have a particular liking to White House Black Market is that they cater to all sizes: regular, petite, plus and short sizing options! I am just shy of 5’4″ so finding petite clothing, especially work wear is always a struggle. For sizing reference I am wearing an XSP in the tank, OP in the jackets and a 00P in the jeans and skirt. I would say that everything runs very true to size.